On Feb.17 I wrote about a bizarre job interview I had. Here is some follow up. When I wrote my “thank you for the interview” email, I said that I don’t want to go to work for the company but I’d consider doing freelance work for them. Much to my surprise, the president of the company said yes. Now we’re working on a contract. Yay! I went to a music festival earlier this week. Among the things I saw and heard were a drum circle and a violinmaker. I’ll write more about the festival later. It was great fun. Computers are wonderful when they work. Having a computer that functions poorly or having no computer at all is terrible. I felt bad for Sydney when she had no Internet access, but I had no computer at all for a few days. Everything had gone wrong. My computer would freeze, dump, or crash several times a day. It sometimes wouldn’t open or save documents. It was infected with lots of adware and spyware. It ran v-e-r-y s-l-o-w-l-y. One night it took me a couple of hours to transfer some photos from my camera to my computer, and that was it. I backed up most of my data on CD. The next morning I called a computer repair shop I had used before. I finally did what several people on v.com and other techie friends had suggested. I had the repairman copy everything from my computer to another hard disc. This meant taking my computer to the repair shop. Ow!! Then the repairman reformatted and reinstalled Windows, reinstalled my software from CDs, and transferred my data and program files back to my computer. He rebuilt the computer. When I got my computer back, I went to Internet Explorer just long enough to download Firefox, which I now use instead of IE. Life was hard for a few days without my computer. I use my computer for everything. My phone numbers, email, lots of sheet music, and notes on all kinds of things were on my computer. I had copied them to CD, but I couldn’t read them. I was so happy when I got my computer back. Now I’m redownloading and installing software, resetting my displays the way I like them, reading lots of old emails, debugging a few things, and reading and writing on v.com. I’m so glad to be reconnected. Thanks to all the v.commies who gave me good advice. I have been finding only about two or three jobs a month that I’m qualified enough to apply for. This week I had a job interview, my first one since last summer. This interview was bizarre. It is a fairly senior level position which I am well qualified for, and the work looks interesting. (I have a Ph.D. and over 30 years of postdoctoral work experience.) A major part of the job would be attending high level scientific/medical meetings biweekly and writing 47 page long reports within three days. That’s not the strangest part of the story, though. The first person I spoke to at the company seemed quite reasonable. Then I spoke to the company president. Usually this is pro forma. However, this woman was different. She told me that she didn't want to hire me because of my age; she'd rather hire someone younger; if I know a younger person who's qualified for this job, please let her know; unfortunately, a younger person would not have the amount of experience necessary to do the job well. Age discrimination is illegal, but I didn't remind her about it. There are 46 employees of the company, and she also has work done by about 30 freelance writers. Now she wants to have more of her writers in-house. I asked her why, and she said that she wants to have more control over people. If someone has problems in their personal life that might interfere with doing their job, she wants to know about it. I wouldn't survive long under her thumb. I think I'd be happier flipping burgers at MacDonalds than working for her. I plan to tell her that I would consider working for her as a freelancer but not as a company employee. There are worse things than being a violin teacher and freelance science writer. Teaching violin suits me well. I like working with people one on one. I like making people happy. I like being told “thank you.” A lot of my students tell me that I’m very patient and very enthusiastic, and I like hearing those things, too. It’s too bad that I need to earn a living. I keep up with the low price end of the violin marketplace through my students. Most of them are beginners who don’t want to spend much on an instrument at first. Recently one of my new adult students went to a violin store and told the staff that she wanted to learn to play bluegrass music, and they recommended a bow to go with the violin. It was obvious that the stick was not made of wood. I tried it and found that it was lightweight and easy to control. I figured that it was a good bow for a beginner, and I was right. She was able to draw the bow smoothly and slowly across the strings and keep it parallel to the bridge much more easily than most beginners would with a brazilwood or pernambuco bow. I thought that it was probably made of carbon fiber, but I was wrong. It was fiberglass, as I should have known from the name stamped on it: K. Holtz FG. It costs about $40 at stores near here. I had thought that fiberglass bows were nearly indestructible and therefore well suited for kids in school. This one actually drew a good sound from the violin. I have another beginning adult student who was experiencing the usual trouble controlling the bow, and she said that her shoulder got tired quickly. She could only practice for a few minutes at a time. She then told me that she had had surgery for her rotator cuff on her right shoulder about two years ago. As part of the surgery, some muscle fibers were cut and then ligated. She took physical therapy after the surgery to strengthen her muscle. She is very active physically, and I was surprised that she had this muscle weakness and hadn’t noticed it. She told me that this muscle is not used much in ordinary, everyday activities. It certainly is needed for bowing. I suggested that she resume the strengthening exercises and buy a Holtz FG bow. She has had the fiberglass bow for one week now, and she handles it much more easily and with much less fatigue than she had with her old bow. When new students come to me with a violin, bow, and case, they almost always have rosin, but never have a shoulder rest. I let them use one of my old shoulder rests for their first lesson and tell them to buy a Kun or Resonans shoulder rest. One such student came for her next lesson with two shoulder rests on a trial basis. They cost $50 apiece. 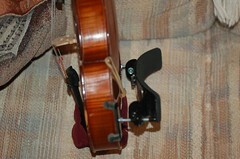 These were not ordinary shoulder rests, but Comford shoulder cradles. (See their website for photos and description.) One was much higher than the other, and both had unusual construction. They attach to the violin with two, rather than four, feet. They really do look and feel like cradles. The foam part is quite high and thicker on one end than on the other. The foam itself felt very comfortable to me – neither too soft nor too hard (like Goldilocks and the three bears’ beds.) I especially liked the higher of the two. 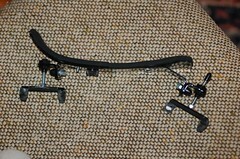 I have a very long neck, and the Comford shoulder cradle is only the second shoulder rest I have tried which is comfortable for me. The one I use now is a Bonmusica. (See my photos below.) It is very high, and the part that goes on the shoulder is curved like a giant hook. The Comford may be just as good, but I’m not going to spend $50 on one now. One of my new students had tried to tune her violin and had trouble. “The fine tuners don’t seem to work,” she told me. I tried, and they didn’t work for me, either. I looked at them closely and saw why: there were no physical connections between the fine tuners and the strings. Maybe they were there just for decoration. Another new student had Red Label strings on his violin. I wasn’t familiar with these, so I looked them up. I found that their major advantages are low price ($19 for a set of four) and high durability. 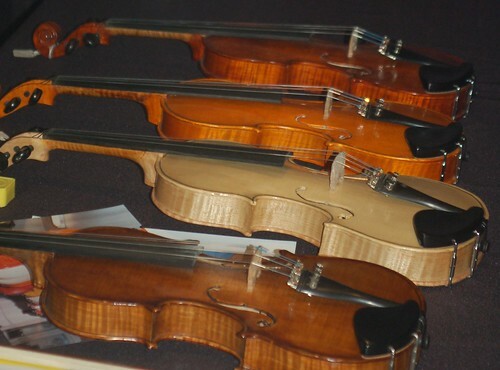 They are commonly used in student-grade violins in schools. It seldom snows around here. When we do have snow, it’s usually mixed with rain, freezing rain, and sleet. It doesn’t stay long. It melts almost as soon as it hits the ground. 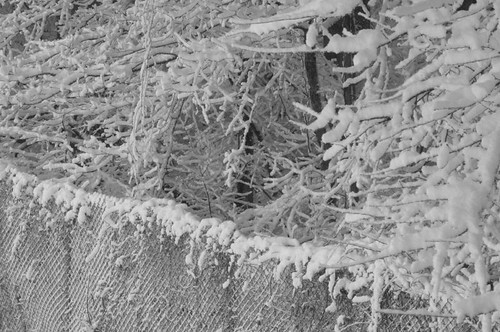 The temperature often hovers around the freezing point, so any snow that has accumulated melts during midday and freezes as ice in the night. There is a lot of slippery ice, including black ice, on the ground, and driving and walking are risky. 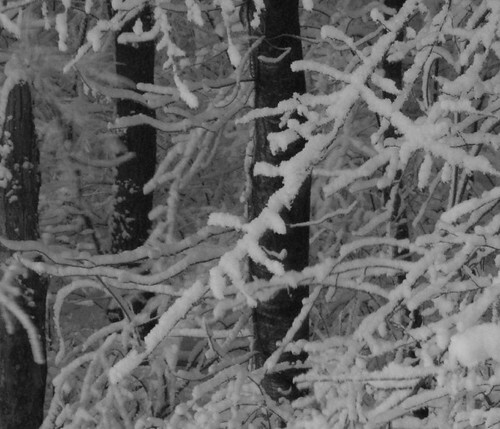 While the snow is falling and accumulating, though, it is very pretty. Conditions were just right to give us pretty snow late Saturday night and very early Sunday morning, and I had a rare opportunity to photograph falling snow. I needed long exposure times, so I got out my trusty tripod, attached my new camera to it, and took the camera-on-tripod out on my balcony. I’ve never done night photography before, so I made some educated guesses about the camera’s settings. The results were not bad. The only problem was that all the photos had a strong yellowish cast. I don’t know why. I used my software to remove the yellow. Here it is: a snow storm in Maryland. I'm listening to the radio, and I just heard something that really excited me. I got up from my chair and cheered. If I live to be 100 and have fantastic achievements, I will never get over the thril of graduating from high school. The music, which was played at my high school graduation long ago, is Elgar's Pomp and Circumstance. Yay!!!!!! I heard an unusual concert today. It wasn’t even called a concert; it was called Afternoon Tea. The name sounds to me like a BBC epic melodrama about the British upper class. To understand this properly, one needs to know some history. The middle class neighborhood where I live now was once very upper class. Over a century ago, Captain James Frederick Oyster and his wife purchased a large tract of land near the location of my current, humble condo and hired an architect to build a nine-bedroom summer home. At that time, this area was a cool, rural outpost miles from the bustling city of Washington DC. Summers in this metropolitan area are hot and humid. In fact, in colonial times, British soldiers stationed here received hardship pay, as they did in India, because of the extreme summer weather. The area near the Capitol building in DC was, for years, a swamp. (Some people believe that it still is.) The summer home was designed with such architectural excesses as a formal portico, a 30 foot wide hall that ran the entire breadth of the house, enormous rooms, and very high ceilings to mitigate the heat. In 1908, the Oysters sold their home to the Corbys, who had made their fortune in a bakery business which, years later, marketed Wonder Bread. The Corbys had modifications and additions made to the summer home, which became their permanent residence. Ever faithful to the spirit of extravagance of their mansion, they purchased 2560 acres of land around their home and created a dairy farm with 22 barns, stables, and outbuildings, as well as a huge greenhouse complex and a private golf course. Years later, an order of nuns bought the estate and converted the house into a convent and school. Subsequent owners used the estate as headquarters for a professional society, and, in 1979, the land and buildings were bought by their current owner, the county government which established a center for the arts there. The newest building on the site is a combined concert hall and music school. Today one of my friends took me to Tea at the Mansion. The Mansion is still a Mansion, large, elegant, and very well kept up. One of its rooms is now a gift shop with beautiful watercolors, prints, scarves, jewelry, and other baubles at upper class prices. Other rooms contain contemporary art exhibits, and one room is for Tea and music. Once there, we were seated at a small, round table and served small portions of very good scones, quiche, baked goods, fresh fruit, and desserts. Sometimes I feel out of place in that kind of environment, like a poor girl from the wrong side of the tracks who wandered into the ritzy section of town by mistake. Today I felt very relaxed. I enjoyed talking with my friend while listening to good, live music. The performers were two young, professional women who played piano-four-hands works by Mozart, Schubert, and Grieg. My friend and I spoke to the performers after they finished playing. My friend asked what the score looked like, and they showed us. When the book was opened, the part for one player was on the left and the other, on the right. This layout was convenient because both players needed a page turn at the same time. I asked whether the works they played were originally written for piano-four-hands or for other groups and then rearranged. They said that all of the Mozart works on the program were written for piano-four-hands, and Mozart played them with his sister. The Schubert piece was written for piano-four-hands, but the Grieg was not. 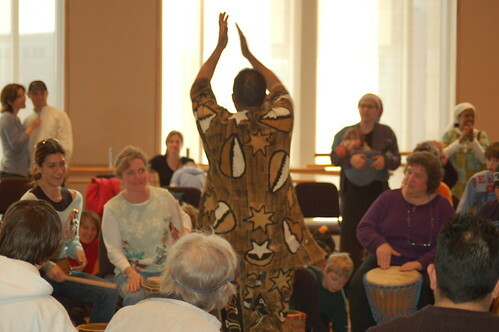 An advantage of attending a concert in this setting was being able to talk to the performers. Many people believe that human society does not evolve, but I disagree. A private home for the wealthy has been replaced by a center for the arts. That is real progress. My budding career as a freelance science writer has hit a big snag -- a $1500 snag to be precise. Congress enacted a law and charged the government agency NIH with implementing it. NIH formed a committee of scientific experts and hired a contract firm (herein called “C”) to facilitate their work. The experts spoke to each other on periodic conference calls and then convened for an in-person meeting with sessions for the whole group and breakout sessions for subcommittees. C hired me to sit in on the meetings of one subcommittee, listen, tape the proceedings, take notes, and write a detailed summary of the scientific discussion. The discussions were interesting, and everything went smoothly except that the tape recorder didn’t work well, and the tapes were almost completely blank. (Remember President Nixon and the 18 minute gap in his tapes?) I did my work, submitted an invoice, and naively expected to be paid according to the contract I had signed with C.
Several weeks after the completion of the project, someone from C (called herein “Ms. C”) called me and told me that the quality of my work was terrible and they weren’t going to pay me for it. I was outraged and insulted and said so. My work was actually very good. Ms. C said that my document had been sent to the chairperson of the appropriate subcommittee for review, and the chairperson said that my work was totally unacceptable. C had to do it over from scratch. I asked Ms. C how her company rewrote the document, since I was the only person from C at the subcommittee meeting, and Ms. C said that they used the tapes. I asked her why they didn’t call me to revise my document, and she said that they didn’t have time to call me since they were pushing the deadline. I know that I didn’t return the tapes until several weeks after the deadline, and the tapes were almost completely blank. I told her that I would take the company to small claims court if they didn’t pay me soon. I have not heard from them. I hadn’t realize that many v.commies have done freelance work and are in a very good position to give me advice. I appreciate the advice you’ve already given me, and I’d like some more. Oh, no! Financial and legal problems. In December, I did some freelance work for a local company. We had a signed contract. I did the work, submitted my invoice for $1500, and expected to be paid. Last week, I got a call from someone at the company who told me that my work was terribly, terribly bad, and they are not going to pay me. I know that my work was actually very good, and I told her so. She came up with an explanation that was patently untrue, and I caught her in her lies. However, that was not enough to make them pay. I am going to take the company to small claims court. Now I’m studying the web pages for small claims court in the county where the company is located. These documents warn me that even if my claim is upheld by the court, the company may not pay me. In addition, I will incur some costs in money and time for filing the case. I feel that I’ve got no choice. That is a lot of money, and, besides, I’m mad. I will write a letter to the company telling them of my intentions and send it return receipt, as recommended. Then I’m off to the wars. Wish me luck.